Paytm Zomato Offer – Get 50% Discount Up to Rs 100, Are you feeling hungry? I hope you hear about Zomato, Zomato is a restaurant service founded in 2008 by two founder named Deepinder Goyal and Pankaj Chaddah. After many up and downs today Zomato operates in 24 countries with 10M reviews, including India, and some foreign countries such as Canada, Portugal, Indonesia, Malaysia, Australia, South Africa, Brazil, USA etc. It features restaurant information such as scanned menus and photos sourced by local street teams, as well as user reviews and ratings. So what we have for you from Zomato? 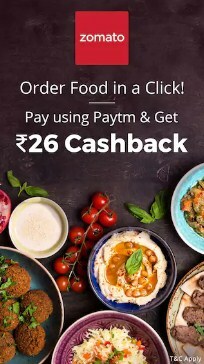 Aforesaid Zomato and paytm is teamed up and offering some discount and cashback when you make the transaction on Zomato App with E-payment website paytm. Did you know Paytm made few changes with their app, Now you will get cashback as paytm Loyalty Cash meaning this cash back can’t be transferred into your bank account or in any other wallet. You can only use this cashback when you recharge, make bill payments etc. So in this Paytm Zomato Offer you will Get Flat 50% Cashback when you make transaction through paytm wallet and completing transaction, 50% cashback will be credited you your Paytm wallet as paytm cash (Means you can’t transfer this amount to your bank account) Also, this offer is valid once per user meaning after availing it one time you can’t use it other time. To know more read below given terms and condition and follow below steps to avail Paytm Zomato Offer. 2) In this deal, you will get 50% off up to Rs.100 when you pay using Paytm. 3) Valid at Zomato Website/App. 4) Offer is valid till 28th March 2019. 5) No minimum transaction amount required to avail the cashback. 6) Offer valid once per user during the campaign period. 7) Apply the promo code at the time of checkout to avail the cashback. 8) In partial refund cases, cashback will be rolled back in the same proportionate amount. 9) Paytm solely reserves the right to change the offer terms at any time without any prior notice to the customer. 10) In case of any dispute, a customer needs to get in touch with the Merchant/Brand. 11) A user who has not undergone Paytm KYC will not receive cashback in their wallet. 12) Cashback will not be processed for NON–KYC users. Get your KYC done to receive the cashback. 2) Now Download Zomato App from Google play store. 3) Install and open Zomato App order some delicious food for yourself. 4) At the time of payment choose paytm wallet. 5) Now download the paytm app from Android market/Google play store. 6) Login with your credentials on paytm app or continue to register a new account. 8) Once your Coupon applied Head to Pay amount using Paytm wallet. 9) Complete your Payment Through Paytm. 10) With 24 Hours you will Get 20% cash back in your paytm wallet. 11) Note – If you don’t have enough credits in paytm wallet then add some bucks/money in paytm wallet. Let us know in the comments section below if you have any query.